Let’s face it, for a family to take a vacation together there are a lot of things to plan and put into place. A little bit of initial prepping and planning can help make your family vacation one filled with happy memories. 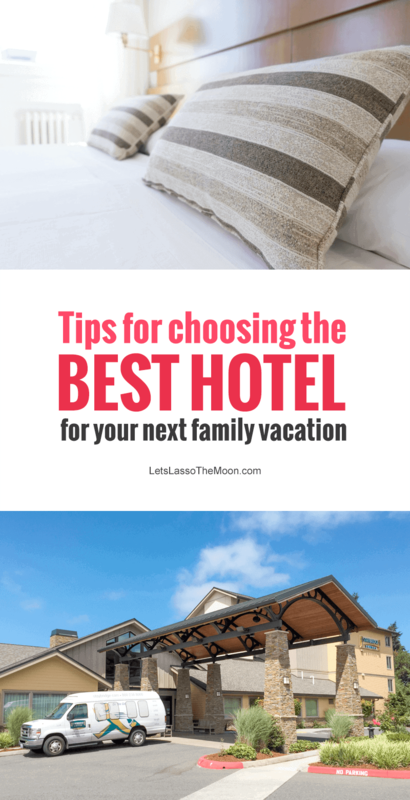 Choosing the best hotel for your vacation can be one of the biggest decisions, which is why I’m sharing some of my favorite, helpful tips for how to decide where to stay. This old real estate saying applies to hotels as well. 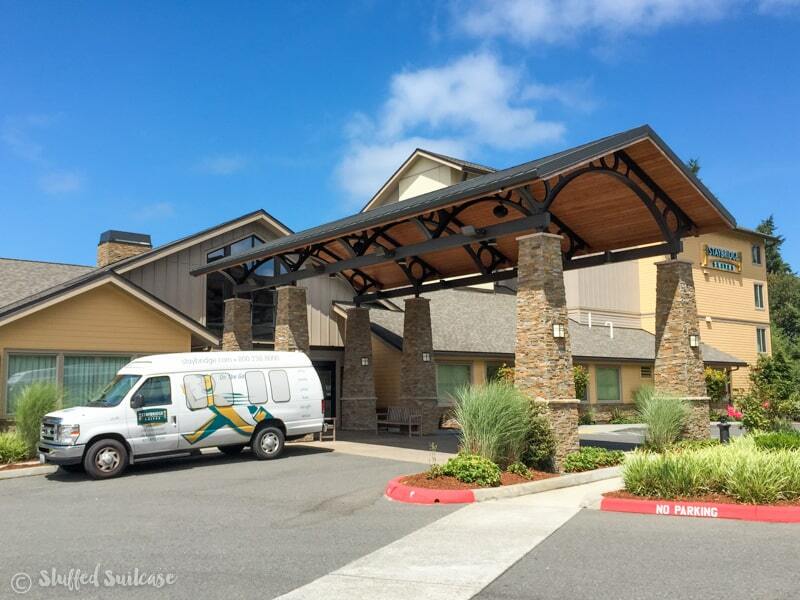 Finding a hotel that is central to your main touring area can save you a lot of hassle and stress. Of course, you’ll probably have plans to visit a variety of locations around a town, but that’s where a little research goes a long way. Use an online map to determine how long of a walk or drive it is from a certain hotel to your destinations. You might even want to print off an area map and use some dots to help locate where you want to visit, and where your hotel options are located. Once you know where your primary attractions are located, it makes it much easier to use a travel search engine or hotel website to view the hotel options on a map. You’ll have narrowed in on an area you want to be and the hotels near there will be shown. This can save you time and stress if you’re nearer to your destinations, plus if an attraction is further away you’ll be prepared for that and can ask the hotel staff at check in what an average travel time is for that destination based on traffic. Amenities are one of my primary focuses when choosing a hotel. Don’t be fooled by just looking at star levels when booking. I recommend deciding before you start researching what some of your high priorities are for a hotel. You might even do this together as a family. Do you want a pool, water slide, golf course, free breakfast, free parking, free wifi? All of these things might matter, but you need to prioritize them in a list. Now armed with your list of what you want most in your vacation hotel, you can start to research. 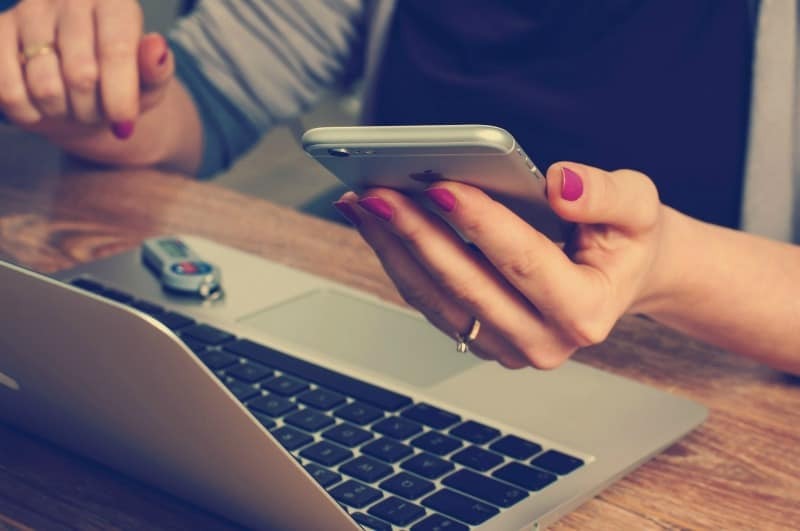 You’ll quickly dial into properties that are located near where you want to be, and that meet, possibly, at least, some of the amenities at the top of your priority list. This is a huge one for families. King beds are perfect for the romantic getaway, or a co-sleeping family, but you might prefer instead two queen beds, or perhaps even a suite. When researching hotels be sure to evaluate what room types they have available. This can be a tricky issue if you’re booking through a third party site that doesn’t specify a room type. Often they’ll assign you a “Run of the House” room type which means upon check-in, or when they assign rooms earlier, you’ll be given whatever room they have available. You can always try to make requests, but don’t expect a certain room type unless you book that type. This one can go along with the amenities list, but as you’re choosing a hotel for your vacation be sure to note any possible “hidden” fees. These normally are stated on a hotel website, but you might not know about them when booking. Often these fees are classified as a “resort fee” or “daily use fee” and are said to help cover fitness centers, newspapers, and other miscellaneous amenities. Many times you can feel like you’re scoring a deal on a great hotel, only to see they charge a $12-$25 / night resort fee. This doesn’t necessarily remove a hotel from your list, however, it’s important to take note if you’re basing your choice on cost. Most people immediately consider the price of a hotel as one of the deciding factors in choosing where to spend their vacation money. But I want to add a little bit onto that calculation, rewards. Do you have a branded credit card for a hotel or even an airline? Often these cards will offer you bonus points when booking at a specific hotel chain with your card. You can also look on the hotel brand’s website for any special offers. Some chains run deals like stay two nights get one free. When you start adding up points and rewards, you might be earning an award that will overall reduce the cost by providing future travel credit. Now you should have some great tips that will help you tackle one of the bigger choices families have to make when planning a vacation, where to stay. I’d love to know your tips on choosing the best hotel or getting travel deals, comment below and share! Meet Kimberly of Stuffed Suitcase. She is a mom and wife who loves to travel with her family. Research and planning for vacations is a definite hobby for her. Pop over to her site for tips on making amazing family memories on the road. You’ll see her sharing peeks of her family life and tips to help you enjoy your family time more. These are some great tips, and I appreciate your advice to make a list prioritizing the hotel amenities your family wants. My husband and I are trying to plan out a vacation for our family, so we need to find hotel rooms that will accommodate the six of us. My kids love to swim, so we’ll definitely put that as one of our top priorities for amenities, and I’ll talk to them about what else they would prefer. Thanks for the great post! We are planning a family reunion and vacation this summer. You make a great point about checking for room types in hotels and other accommodations. Having things like connected rooms or space for a crib can make a big difference for families with younger children. It can be a good idea to compare hotel rates and their accommodations like room size, complimentary breakfast, and even a pool. Having a pool can be a great way to keep children entertained and help you unwind after a busy day of traveling. Thanks for your tips. Thank you for the help. My wife and I are planning a vacation for this summer and are looking for hotels. I am glad that you brought my attention to possible hidden fees. Is this something that we could even talk through on the phone with someone from the hotel? I thought that you tips to find out about any hidden fees that a hotel might charge seems important before booking a room. There have been a few times when I would be surprised by fees that hotels charge me. I’ll be sure to find out more about them so that I can have a lower bill after checking out of my room the next time I go on vacation. You do want to not just look at star levels for a hotel. What you want to do is see why they got those stars. Figure out what people are saying, read the reviews, and this will give you an idea on if you want to stay there. I like your tip on taking the amenities into account when looking for a hotel. I would imagine that finding somewhere where you can have fun and enjoy yourself would probably be somewhere you would want to stay. My family and I are looking for a motel to stay at for our vacation so maybe we should check the amenities when we do. If I know that a family member or friend has been somewhere that I plan I traveling, I generally will ask if they have any recommendations. Great tips, thanks for sharing! My family is going on vacation but don’t know what to look for in hotels. Thanks for the tips about room types. Hopefully, we can find a good place to stay during our vacation. Checking to see if you have a branded credit card for a hotel or airline seems like a really good idea. I would imagine that I’m not the only one who would overlook something like this. It’s a simple tip but it sounds like it could really be helpful when planning a vacation. I like your suggestion to look over all the amenities with your family before you book. A 3 star hotel may have some amenities that a 5 star doesn’t so it’s good to take a look through everything you can. If a hotel meets your needs it may not matter what it’s overall rating is. My husband and I are planning on going on a late honeymoon and so I really appreciate all of this hotel advice, especially the one about hidden fees. We are always on a tight budget and so we are definitely not interested in any hidden costs. I’m not sure whether or the hotels that we have been looking for have resort fees, but, if they do, do you think that it would be possible to get those charges removed if we don’t use whatever it is for? My family just needs a quick place to stay for a night so we can continue our road trip. I think two queen beds would be sufficient. Our two kids can share a bed. These accommodation tips are great, thanks. I think it’s a great idea to research what your high priorities are. Whenever I stay in a hotel, I like to make sure that they have free breakfast. I always enjoy when I can just relax and not have to worry about a meal. I really like your tip to be aware of hidden fees. If you are going to use the gym or other things covered in resort fees than it might be worth it. If you don’t need those amenities then it might be better to look somewhere else. Is it possible to get hidden fees removed if you don’t use the amenities? Thanks for these great tips! I want to make sure that I find the perfect hotel for our vacation. I didn’t even think about location! It would be really cool if we could find one that had a nice view, or was conveniently close to places that we need to go. Thanks for the tips! It is always a good idea to look up any fees that are going to be associated with the hotel. Ask any and every question that could involve hidden costs! That way, you won’t be caught off guard when you have to pay. I would hate to be surprised with an extra dollar amount that I didn’t plan for. I totally agree that there is a lot of thought and time that has to go in a family vacation. You’re not just preparing for yourself, but for those you love as well. I’m glad you mentioned hidden costs as well as rewards. It’s easy to rush into finding a good hotel to stay at without checking into specific discounts and rewards, and it’s also so important to stay away from places with hidden costs. In the end, the places with the best reviews are most likely a safe bet. I have been looking for the best hotel room for when my family goes on our vacation soon. I like how you point out that you should look at the amenities when booking a hotel and make sure the hotel provides fun for all such as a pool, a golf course, and wifi. We won’t be at the hotel around the clock, but while we’re there, we’d like to enjoy ourselves and have fun as a family. I’m thinking about taking our family on a vacation and am looking for a quality hotel. In your article you mentioned checking on what specific rooms are available. I know in my family, certain members of the family would prefer to be in a separate room than other members. Thanks for the great read. These are some great ideas for finding a good hotel. My family and I want to take a vacation to California in the future, so this is really helpful. I will make sure to look for any “hidden” fees that the hotel might have! My wife and I have been thinking about going on vacation for a while now, but we weren’t sure how to find the right lodging. I really like that you say to find out what different services they might offer. I know that I would want to get the most convenience that I can. A friend of mine was telling me that he is planning his vacation for the summer, but they weren’t really sure where they were going to be staying. One thing that really stood out to me is that you say to research some of your high priorities for hotels. It would be nice to see if any of those mean that you have to pay a little bit extra. Thank you for the information on picking the best hotel for my needs, and what rooms to consider when making a decision. Personally I believe that it’s important to find a hotel that has a room that suites the customer’s needs, and has the ability to make accept requests for specific room types. This information should be helpful if I decide to take a road trip with some friends sometime in the future. Thanks for the tips for choosing a hotel. My wife and I want to take our family on a trip this summer, so we are trying to choose the best hotel possible. I like that you mentioned to make a list prioritizing the amenities that your family will need. My kids really want a pool, so I will make sure that I put that high on the list. Thanks for sharing. I love your idea to make a list of what you want most in your hotel and then start to research. My husband and I are taking a trip this summer out to New Jersey, and we want to find something that has all of the amenities that we want. We would love to have something close to the beach so we can spend some time outside in the ocean.